Create Kid-Safe Spaces – Kids will always opt for the outdoors if you give them a reason. Build a secure space with plenty of hiding places and you may never see them again – until you call. Build a Private Retreat – A shaded spot on the deck with the right bushes placed all around makes a cozy corner for one – or two! – whether reading or sleeping is on the agenda. For more information on these and other landscaping topics, or if you are in need of an Atlanta landscape designer, please contact us directly at 888-210-1116. Outdoor Expressions – Making your outdoor space a place to remember. They Create Views – Used wisely, hardscapes are ideal as “landing pads” or viewing points where you and your guests can stand to examine the surrounding landscape that you have so carefully cultivated. They Define Spaces – Wood, stone, and metal can be crafted into specific shapes so any type of space can be created. 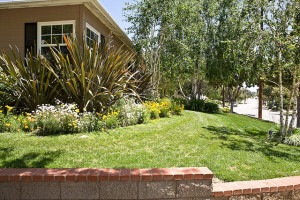 Adding plants and shrubs afterward soften the edges and offer a completed look. They Lead the Viewer – If you’ve ever heard the phrase, “led down the garden path,” you will understand what I mean. Paths are ideal ways to bring your guests to a particular feature or focal point. For more information on hardscape construction in Atlanta, please contact us online or by phone, 888-210-1116 at Outdoor Expressions. Outdoor Expressions – Making your outdoor space a place to remember. 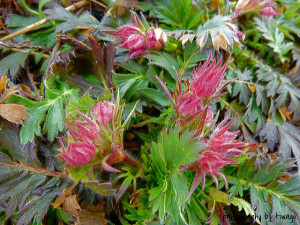 Prairie Smoke – This hardy perennial is ideal for full sun and dry soil. It does not really spread out particularly well but it does bloom from early spring through late fall in a variety of colors. Prickly-Pear – With its distinctive look and love of gravelly soil, this plant native to the Southwest is remarkably hardy almost everywhere south of the Mason-Dixon line. Use it sparingly though as it is quite tenacious. 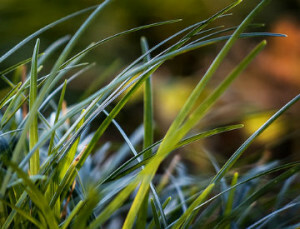 White-Tinged Sedge – If you have a real problem area, this is the last resort solution. It handles every challenge with good grace. Plant it almost anywhere and it will grow. 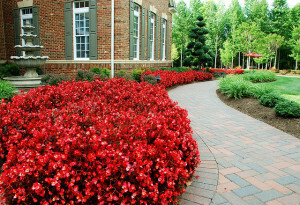 For more information on commercial landscaping firms in Atlanta, please contact us at Outdoor Expressions. Outdoor Expressions – Making your outdoor space a place to remember. Sunflowers – These eye-catching plants are quite hardy – some even consider them a weed – but they create one of the best habitats for our avian friends. Sage, Rosemary and Oregano – Homeowners will love these plants as they do double-duty – bees love their aroma and so gourmets love their flavor. 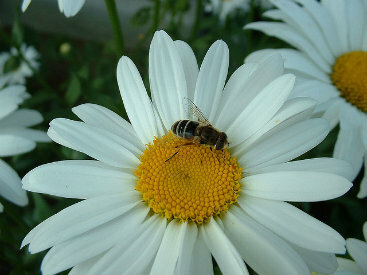 Asters – Another flowering plant favored by bees, this star-shaped plant is ideal for borders or can be planted quite successfully in pots. Black Eyed Susans – Available in a wide number of varieties, this plant is especially useful as it blooms for most of the spring, summer and fall. For more information on this and other landscape topics or if you are in need of a commercial landscaping firm in Atlanta, please contact us online at OutdoorExpressions.net or phone directly to 888-210-1116. Outdoor Expressions – Making your outdoor space a place to remember. Embrace Geometry– Landscapes can be significantly sculpted to complement the regularity of a house. Consider adding brick paths with right angles, hedges that are trimmed as rectangles or even triangularly shaped trees that mimic the roof line. Add Color as a Contrast – Using plants and trees as a “green” background will allow you to paint your house and its trim in a variety of colors that stand out against the landscape. Integrate Proportional Elements – As an example, slender windows that overlook a garden of thinly designed plants beds can highlight each other. For more information on these and other ideas for planning your landscaping projects, please visit us online at OutdoorExpressions.net or, if you are in need of a commercial landscaping firm in Atlanta, please call us directly at 888-210-1116. Outdoor Expressions – Making your outdoor space a place to remember. Common Plantain – This very hardy weed loves a lot of water. Any portions of your lawn that contain it are either in a depression that collects water or is being overwatered by your sprinkler system. White Clover – This particularly hardy plant can live in soil that will not support other ones. If your lawn is overrun with this weed, it means that the soil is low in nutrients and needs to be properly fertilized. Knotweed – Low lying and fast spreading, knotweed depends on other grasses not being able to establish a foothold in dense or compacted soil. Aeration and the addition of compost can help this problem but usually takes a lot of time and energy to accomplish. For more information on this and other landscape maintenance issues, please visit us at Outdoor Expressions. We can be found online at OutdoorExpressions.net or reached directly at 888-210-1116. Outdoor Expressions – Making your outdoor space a place to remember.